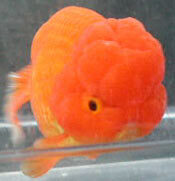 The British lionhead is closer to the flat-backed Chinese lionhead than to the ranchu (which has a dorsal contour that curves sharply down to the caudal peduncle). The hood is the dominant feature and the fish should have a nice clean back. 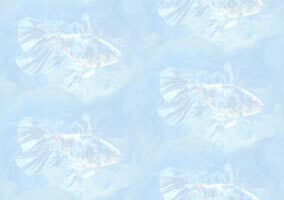 This is a popular fish amongst BAS members. There is a long-finned version of the lionhead known as the shukin in Japan. Depth of body to be approximately 60% of body length. The fish should be bright and alert. The body should be medium length with smooth contours and no sign of a dorsal fin. The caudal fin should be well divided, forked and held above the horizontal. The hood should be well developed in all three areas, i.e. 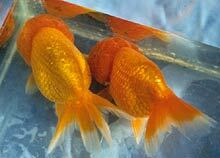 cranial, infra-orbital and opercular (see "Finnage and body plan" on our goldfish information page). Two self-coloured red metallic lionheads. The fish on the left could ideally have a larger hood; that apart, both are very fine specimens. Notice the caudal fin (tail), which is like that of the fantail, and the relatively flat dorsal contours with no trace of a dorsal fin. The fish on the right was caught on-the-turn by the camera. Self-coloured red metallic lionheads. Both fish have good hood growth, which can sometimes give the fish an almost 'toy' facial appearance, as in the fish on the left. The fish at top-right is a variegated red-and-white metallic fish and has slight ranchu characters (see Other Varieties). In self-coloured red fish, it is common to find greater colour intensity in the hood than in the rest of the body; the fish on the left is unusual in having equal overall colour intensity. A fine fish with a nice colour balance, shown at BAS 2001. Some lionhead strains have been in the hands of individual breeders for 50 years, and these were passed on from uncles, grandfathers and other family members. The starting quality of the stock was therefore very good. Strains kept are mostly pure red, and some have a small amount of white in them. Breeding stocks of up to 40 adult fish are kept, with about 150 babies being prepared for the following year. Outcrossing has featured fairly frequently, mostly in the form of swaps between members; one breeder some time age incorporated a black lionhead into his red stock which - perhaps unexpectedly - had a beneficial effect on overall colour. No particular breeding scheme is followed; rather, the best adult fish are selected for breeding. Sometimes a strain does not spawn in a particular year, the reason for this remaining unknown. It is not easy to improve lionheads. In good strains, out of 1,000 fry about 50 will be worth keeping; of these, about 5 will be up to show standard, which is a ratio of 200:1; this return is compatible with ratios for other types such as Bristol shubunkins and fantails. The most difficult characters to maintain are the divided tail and the clean, smooth back with no dorsal fin. Good strains seem to remain in a steady state, suggesting that outcrossing may be the only way to improve stock for certain characters. The fish start the spawning process in ponds, whereupon breeders bring them into clean tanks in their fish houses and hand-strip chosen pairs to control matches. Standard foods are fed to adults and fry. The most popular flakes are Aquarian and King British. Daphnia are fed when available. The first, major cull is for single tails, spiky dorsal contours, pinks and bronzes; thereafter culling is progressive over the ensuing year. The young fish are brought on in ponds (like the one illustrated on the right) and are hardy enough to overwinter outdoors. There is always some natural wastage over the winter, and some owners lose a few females to over-amorous male frogs in early spring. Fish are brought into fish houses only if a very cold spell is forecast, and in some cases are routinely brought inside in January/February to escape the frogs. Few water problems are encountered in the area these days. Tap water is allowed to stand and then used for both tanks and ponds without trouble. As breeders do not generally buy fish from pet shops, few diseases are introduced. Gill flukes can be troublesome, but early culling to reduce stock density and regular water changes keep the problem down. Lionheads are hardy fish in southwest Britain (Bristol, Gloucestershire and Somerset) with its mild winters, and live for 7-8 years on average.